Does the Bible say Jesus was a Nazarite like Samson was? There isn’t a lot of biblical history about Nazarite’s. The word itself means “one who lives apart” or “one who has made a vow of abstinence,” and some of the prohibitions for the Nazarites were the same for the high priests and the priests during worship. The high priest had these restrictions throughout their life, just as a Nazarite would. Nazarite’s and the high priests were restricted from drinking wine or anything made from grapes, they were not allowed to cut their hair or touch any dead carcass, human or animal, but what is most interesting, they both were “set apart” for God’s use. This was what Samson was called to. He was the most famous Nazarite of all, unless Jesus was a Nazarite. Samson, like all Nazarite’s, was not allowed to drink wine, consume anything made from grapes, cut their hair, or touch any dead carcass, human or animal. Clearly, a Nazarite was called to be in a position of a priest to intercede on behalf of the people. During Samson’s day, there were few priests and everyone did what was right in their own eyes. During this time period of the Judges, God would raise up a judge for Israel because they had fallen into idolatry (Judges 2). After Joshua had died and Israel fell into idolatry, “the Lord raised up judges, who saved them out of the hand of those who plundered them. Yet they did not listen to their judges, for they whored after other gods and bowed down to them. They soon turned aside from the way in which their fathers had walked, who had obeyed the commandments of the Lord, and they did not do so” (Judges 2:16-17). Samson was a Nazarite but was also a judge of the nation Israel. God raised him up for that very purpose, but of course, we know from biblical history, he failed in his leadership and broke his Nazarite vows by doing just about everything a Nazarite shouldn’t do, and when his hair was cut, it was the end of Samson’s God-given strength. Even though God knew Samson would fail, He allowed this man to fall into sin, but as God often does, He uses evil for good (Gen 50:20). We can only look at the cross to see how the greatest evil of all rendered the greatest good of all (John 3:16). In the end, it doesn’t really matter whether Jesus was a Nazarite or not. He did not come to be a Nazarite but to give His own life as a ransom for many who would trust in Him (Mark 10:45). What greater purpose was there? If Jesus was a Nazarite, then He was raised up by God to be a judge and that is what Jesus is. He will judge the nations and rule them with a rod of iron and there will be peace on the earth, as “the” Judge Who has been set apart by the Father to Judge the world, but it would seem wrong for Jesus, if indeed He was a Nazarite, to partake of the wine during the Passover meal. Even worse for a Nazarite, Jesus turned water (something Nazarites could drink) into wine (which was forbidden by Nazarites). I think there is not enough evidence, either biblical or extra-biblical to say Jesus was a Nazarite. 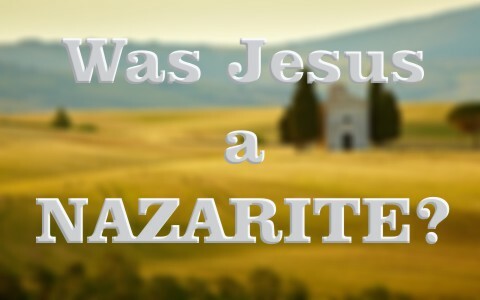 Even though He is called, “Jesus of Nazareth” (Matt 26:71), He is not called Jesus the Nazarite. It actually says, “This is the prophet Jesus, from Nazareth of Galilee” (Matt 21:11), so we could just as easily call Him Jesus of Galilee, because it would be more accurate. If fact, confusion about whether or not Jesus was a Nazarite can be easily settled when you read Matthew 2:34: “And he went and lived in a city called Nazareth, so that what was spoken by the prophets might be fulfilled, that he would be called a Nazarene.” Though it is also true that Jesus was rejected in the city of Nazareth (Matt 13:55-58). I can be Jack from Belle Plaine, but no one ever refers to me as “Jack of Belle Plaine.” They might associate my name with the town or my town with me, but I am not my town, just as Jesus is not Nazareth. The question of whether Jesus was a Nazarite fails by His not avoiding certain things like drinking of the vine (grapes or wine) and touching dead carcasses (He touched the dead to raise them to life). In the religious order of the Jews, if you touched something dead, you were deemed unclean. Same for lepers, and women who had blood issues, but again, Jesus shatters their tradition and trappings of the Mosaic Law to show that God desires mercy and not sacrifice (like works). Doing good is useless without obedience because God will not accept an offering from polluted hands. We must come before God with a clear conscience and clean hands, although not sinless, but we must do good because we love God. Since the judges of ancient Israel were the leaders of the nation, so too will Jesus, as the supreme Judge, rule…but not just Israel. He will rule the world with a rod of iron, but as judges did, and so did Nazarites, they offered sacrifices for their people, but this is a far better sacrifice that Jesus made because He offered His own life. If not, we’d have no way to be reconciled to God. It was through the eternal sacrifice that Jesus paid that will keep the doors of heaven open for all eternity, at least for those who have been brought to repentance and trust in Christ. Many people will question Jesus’ existence, so even though they might not believe, what they believe doesn’t change what is true, and that is Jesus Christ does exist, has always existed, and is coming again to judge the world in righteousness. Either Jesus will be your Judge (Rev 20:12-15) or He will say to you, “Well done, good and faithful servant. You have been faithful over a little; I will set you over much. Enter into the joy of your master” (Matt 25:23). That kind of joy cannot even be described. More for you to read: What Are Some Other Names for Jesus?